This was quite a project that began with an enquiry from a well known international hotel chain. Could I make a cake large enough to feed 500 people for a special Diamond Jubilee Celebration? Only caveat was that the cake had to be in the form of Buckingham Palace! So began a very hectic week to bring together the largest cake I had ever made. I decided to make a caricature of the Royal Palace in five separate pieces if only to make the transport somewhat easier. Experimenting with different coloured icing soon demonstrated that if I copied the greyish colours of the Buckingham Palace exactly it was going to look a little dull. I decided on a rather lighter yellowish colour that seemed to work quite well in the end was the right choice. Shopping for the cake ingredients was interesting, its not usual for me to walk into my local store and take out most of their egg stock! At first the going was slow as the mixing and baking took its time but once the main five pieces were completed the work of decorating the cake could begin. It took around four days to get the cake finished to a standard I was pleased with. Come the day on the party it took quite a bit of care to get the cake safely to the venue and even more care to get it properly setup on its table. Unfortunately I was not there for the evening unveiling but I understand that the cake created a lot of interest, as you would expect really, its not everyday that you come across a Buckingham Palace shaped cake stretching across a large table! There are plenty of pictures of the making of the cake but none I am afraid of the destruction of it! 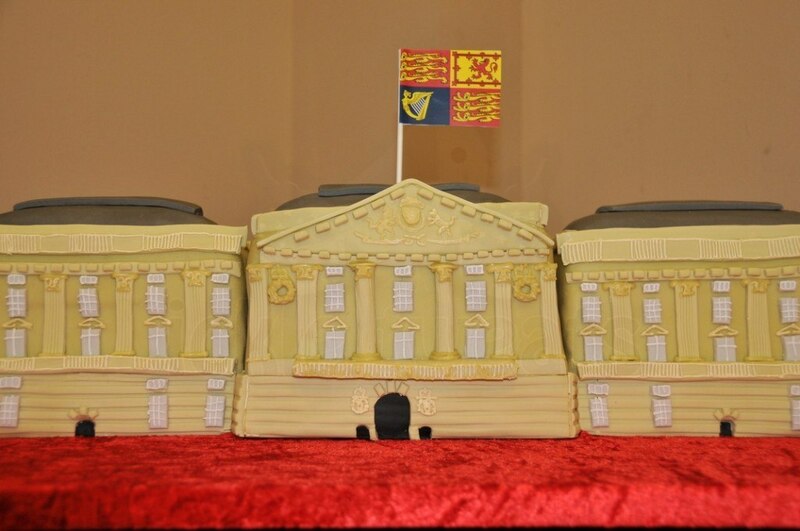 If you want to see how the Buckingham Palace Celebration Cake was made just follow the link.